I am pretty sure 4 didn’t, so I am glad I skipped an installment. This looks much more interesting now than it did. I was bored with a simple world-building mechanic. You’re probably better off. I was fine with more of the same and now with MP! But really those two felt too close to the same. 6 might feel even newer for you as a result. I do remember sending someone who was running against me in jail for some re-education after he lost… and I may have sent the military to take car of one who as about to win. The trans improvements and tunnels seem great to me. 4 is fantastic. 5 is garbage if you, like me, can’t get past the horrific army mechanic that you’re forced to engage with over and over. I’d love for 6 to be good, but I’m definitely waiting to see. I would say 4 is just as bad as 5 when it comes to combat, but 5 forces you to like… do it. Oh for sure, the combat is super dumb in 4. But you can pretty much build a couple army bases and get on with your life. 5 really grinds your face in the awfulness until you have to restart entire scenarios because you didn’t plan for the scripted piles of enemies to teleport onto your island at whatever timestamp. 100% Agree. I liked those scenarios the least, but when 5 came out, I think I was just itching for some city building… still kind of am. Anno is promising and maybe this too. Yep, seems like typical Tropico to me… Take the base of the older games and expand upon it in both a good and a bad way. The additions and changes they are making with 6 look like they should be worth the price of admission for me, I always enjoy some Tropico. Not sure how I feel about some of the aspects of the game they are trying to play up and emphasize, they’re doubling down on the megalomania and El Presidente grandiosity a bit too much for my liking but I’ll roll with it. 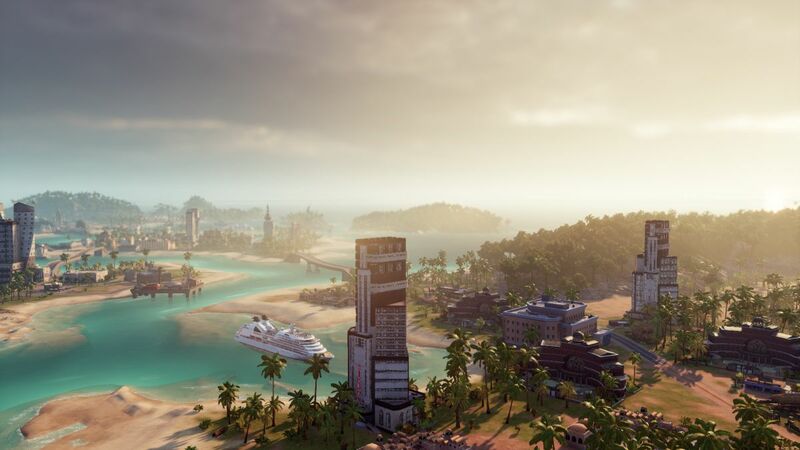 Personally, I play Tropico less for the now rather hammed-up El Presidente personality plus humour and more for the Caribbean-like setting, aesthetic and the unique blend of city-building/political gameplay it offers. Though Tropico 5 was a bit one step forwards and two steps back with some of the changes they made, since they couldn’t just wholesale take 4’s content and build on it like 4 did with 3. While the concept of the eras and tech tree was a fun idea, realistically I felt that the game needed more content\variety in each era to execute it better. The building variety was certainly blander for it compared to 3\4 where some buildings like Tenements could have variety in their models and paint palettes. Meaning cities in 5 could look a lot more copy and paste then they might do in 3 & 4. Despite the fact that Tropico 4 was in a lot of ways Tropico 3 but even grander/better, I think I love Tropico 3 the most out of the new Tropico games. Part of the reason for that would be that they changed some stuff in Tropico 4 which I liked about 3, such as El Presidente having negative traits (like alcoholic or compulsive gambler) that added some flavour your character. Felt like they really cut back on the actual character, in a thematic and RPG sense, by 5 where everything seemed like it was bland minor gameplay-related stats boost. This might be blasphemous, but to me, the third Tropico felt like the best game. Tropico 4 felt much the same as Tropico 3, except for the cabinet. Completely in line with Nesrie’s apt comment earlier about more of the same and not enough new. Another thumbs down with Tropico 4 is it also included the modern times expansion and that killed the vibe of building a tropical dystopia. The modern buildings looked stupidly at odds with everything I had built in my tropical city to that point. I don’t know if I can describe it well, the city stopped looking good as a result of modern times buildings. Tropico 5 on the other hand. Yeah, that was enough for me to now wait and see how 6 ends up. I didn’t really care for the dynasty stuff. The managers sucked too, though having the buildings that could have extra things unlocked was nice to a minute point. There was really no reason not to spend the money getting the upgrade. I tried to play 5 the other day and it grated on my nerves more than it should. They really need to add Trump as a dictator choice. I still play the first Tropico once or twice a year. I should give the third one another try to see if I like it any better. In fact I should play the first four since I own them all. I did not pre-order, so no feedback from me. Yeah, I am gonna wait and see. I may do this one. It’s funny, the part of the Tropico series I tend not to like is the part that makes it different - the factions and political stuff. Sometimes I find it too ambiguous. I do think the rest of it is some of the best for games of this type. Saw someone on Twitch playing the beta. He concluded it was too buggy/incomplete in its current state to enjoy, so he went back to playing Tropico 4. As much as I look forward to some games, I generally prefer to not take part in betas. In fact, the more excited I am about a game, the less I want to be in the beta. I really would prefer to experience a game for the first time in its complete state. While all games, even at release, have bugs, I can at least be fairly confident that there will be fewer than in beta (after all, that’s what a beta is for, right?). I just don’t want my very first experience with a game I’m looking forward to to be marred. Of course, “early access” blurs that line quite a lot, but I try to do my research to find out what state an EA game is in before I take part. I don’t recall the recent version of Tropico releasing with particularly nasty bugs. I think I am more concerned with whether they accomplish their new features and if the game is different enough from the past ones to warrant their asking price. Kalypso and Limbic are working hard to add as many of the community requests for enhanced features and gameplay as possible into the release version of the game. Therefore, the game has been moved to March 29, 2019. If one of those improvements is “unfuck the ruinous military aspect of Tropico 5,” I’m for it. There is an open beta going on until Friday - I learned from GWJ. All right. So I just played this for 3 hours in coop. We had one crash, and the host, not me, made a mistake with victory conditions the first time, but it did let me try 3 maps. My initial, limited opinion is it’s so familiar, so the same that no tutorial is needed. For me though, the fun is still there. There’s a bit more to do, some building scaling has been addressed (the roads are kind of messed up, technically), and I generally like it. They’re probably going to take some hits from some for it being too much the same though which has been a common complaint for the series from 2 on.